Sewage originates in our homes and industries. Domestic sewage consists of everything that goes down the plughole in the kitchen, bathroom, toilet and laundry. It also includes the 'gully' trap, but should not include run-off from roofs, streets, driveways, etc. which flow into the stormwater or drainage system. On average, three quarters of the water supplied to domestic customers and most of the water supplied to industrial customers ends up being collected by the sewerage system. Naturally, this proportion varies from summer to winter and depends on whether you live in a flat or a house with a large garden. We own and operate a network of sewer pipes and pump stations to collect sewage from customers. Around 93% of the sewage collected is transferred to Melbourne Water for treatment at either the Western or Eastern Treatment Plants. Around 7% of the sewage we collect is treated in one of nine small treatment plants Yarra Valley Water owns and operates. These plants principally service outer areas, which are too distant for sewage to be economically transferred to the Melbourne Water system. Because the water from these treatment plants is released into rivers and streams, a high standard of treatment is provided. There are also some parts of our district where there is no sewerage system. Properties in these areas usually have septic tanks. A program is underway to provide sewerage services to properties which are too small for septic tanks to work effectively. Rain water which falls on urban areas and any excess water from garden watering or other outdoor uses is directed to the stormwater drainage system, which generally drains to a local creek, river or ocean. The stormwater collection system is separate to the sewage collection system and is operated by local government and Melbourne Water. Illegal connections of stormwater to the sewerage system are a cause of sewers overflowing. Additionally, water used in industry for purposes such as cleaning is collected by the sewerage system. Water collected from industrial and commercial properties which goes to the sewerage system is known as 'trade waste'. Treated water from the Western Treatment Plant is released into Port Phillip Bay, where it rejoins the natural water cycle. Treated water from the Eastern Treatment Plant rejoins the natural water cycle in Bass Strait. What happens when you pull the plug, wash your clothes, have a shower or flush the toilet - where does all the water and waste go? There are two separate systems which carry water away from your home. Join us on a tour of the sewerage system. Sewerage system - carries water and wastes away from your laundry, kitchen, bathroom and toilet. Stormwater system - carries any rain water away that falls on your house, garden and street. It also collects water used outside the house (e.g. for watering the garden) which is not absorbed by the soil. Did you know that what we call sewage is over 99% water? When sewage is treated the remaining 1% - suspended solids, organic material, nutrients like phosphates and nitrates and disease-causing organisms (mainly bacteria) is removed. After water goes down the plughole, it first passes through a water-seal. This seal is a bend in the pipe that is either shaped like the letter S or the letter U and is commonly referred to as the 'S bend'. The water trapped in the bend creates a barrier that prevents smells further down the pipe from entering your house. After the water-seal, your pipe would be joined by other pipes that carry sewage away from your home and all of this sewage would then go to a sewage treatment plant or, in a few areas, a septic tank. The best way of treating sewage from your home is by carrying it away through a reticulated sewage system to a sewage treatment plant. Homes that are not connected to a reticulated sewage system must rely on a septic system to treat the sewage on site. As sewer pipes contain organic wastes, unpleasant smelling gases can build up in these pipes. Just as water-seals are part of the fixtures in your home, there are also water-seals in the sewer pipes that carry sewage away from your home. Gully traps and sewer vents are also built into these pipes. These two fittings allow gases that build up in the sewer pipes to be carried away. If the reticulation sewer becomes blocked the gully trap will also stop sewage from returning up through the system and spilling into your home. For this reason, it is not a good idea to cover over your gully trap. Reticulated sewerage systems (network of pipes) carry sewage from homes to modern sewage treatment plants. Treated water from these plants is either reused or released into the environment. The pipes in your home are generally made of UPVC plastic or iron and the underground drains would probably be made of clay or UPVC plastic. These underground drains would lead to a reticulation sewer that carries the sewage to the nearest sewage treatment plant. The Brushy Creek Sewage Treatment Plant is used here to describe the typical processes which occur at our local sewage treatment plants. All of our plants use a form of the activated sludge treatment method. This is a form of biological treatment and is used to remove organic material and nitrogen from the sewage. Activated sludge treatment, introduced over 80 years ago, is one of the most common sewage treatment processes in use world-wide. 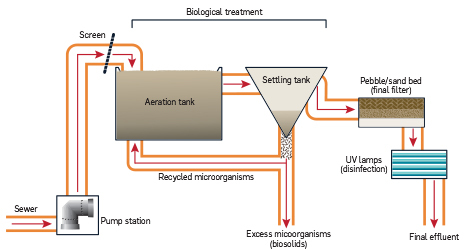 A conventional activated sludge plant layout is shown below but each plant is slightly different. Activated sludge plants can be designed to remove between 60% and 95% of organic matter and suspended solids. They require large amounts of energy to aerate the sewage in the aeration tank. 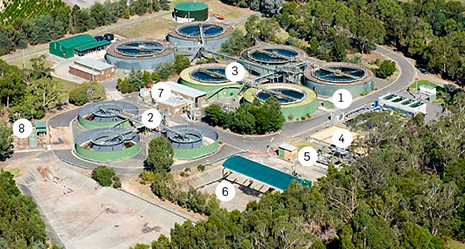 See the aerial photograph below to discover what happens at each stage of sewage treatment. Follow the numbers. Powerful pumps are needed to lift the sewage entering the plant through the sewerage system. The sewage is first pumped to the automatic screens. Screens (the sloping structure near the centre) are required to remove items of rubbish from the sewage. Typical items collected by the screens include sanitary products, rags and cotton buds. Activated sludge treatment, introduced over 80 years ago, is one of the most common sewage treatment processes in use world-wide. This well proven technology involves growing a population of bacteria and other micro-organisms in an aeration tank (the outer ring of the tank), where the sewage is held for several hours. The oxygen, provided by aerating the water, allows the bacteria to function more effectively. After about 24 hours, the sewage passes into the inner circle of the tank which is used to allow the sludge, a mixture of bacteria and other micro-organisms and solids, to settle out. Conditions are arranged so that the micro-organisms clump together. These clumps can be settled out and returned to the aeration tank, leaving purified sewage behind. The micro-organisms convert organic materials in the sewage to water, carbon dioxide and new bacterial cells. At this stage, the water may still contain nitrogen and phosphorus compounds and some microbes so further treatment is necessary. A conventional activated sludge plant layout is shown below but each plant is slightly different. For example, in some plants, the aeration tank is also used as the clarifier by turning the aeration off for a period. Activated sludge plants can be designed to remove between 60% and 95% of organic matter and suspended solids. They require large amounts of energy to aerate the sewage in the aeration tank. Before the treated sewage can be disinfected and released, it must be filtered again to remove any remaining suspended solids. Pebble beds, or in newer plants, sand beds, are used to filter the sewage. The sewage treatment processes described so far will only remove some of the disease-causing organisms from sewage. So, before the treated effluent is released, it needs to be disinfected to kill, or inactivate, most of the pathogens present. It is preferable to provide several treatment stages, including the treatment processes already discussed, which provide at least partial disinfection. This provides multiple barriers to the transmission of disease, an important principle in public health engineering. All of our treatment plants use UV light disinfection. UV light is generated using special fluorescent tubes and the water is passed under them. UV light can kill bacteria and viruses, but the success of the process depends on the water being clear. The pebble bed filtering stage ensures this. The empty overflow basin can be seen in the background. It is used to store sewage when the volume produced increases after heavy rain. The pond in the foreground is where the purified sewage was treated with chlorine before the UV disinfection plant was built. The sludge which has been removed from the sewage during its purification is sent 8 kilometres via a special sewerage pipe to a main sewer. This takes it to the Eastern Treatment Plant where it is treated further. The now purified sewage is either released into the nearby creek or used by local industries for irrigation, especially in summer. Powerful blowers pump air into the outer ring of an aeration tank, providing the oxygen required by the bacteria to break down the sewage. Various chemicals, usually an iron salt or possibly alum (aluminium sulfate), are added to the sewage before it enters the activated sludge process described below. These chemicals react with the phosphorus compounds dissolved in the sewage causing the phosphorus to precipitate out as solids which form part of the sludge. Sewage, from the area surrounding the plant, is pumped into the Brushy Creek Plant to the screens. The screens remove a variety of larger objects from the sewage. From here the sewage flows to one of the activated sludge aeration tanks. Brushy Creek has nine of these tanks. Large air blowers are housed in the blower buildings. These provide air which bubbles through the aeration tanks. In these tanks, bacteria are added in the outer ring. The sewage stays in the outer ring for about one day where the bacteria with the aid of oxygen, provided by aeration, break down much of the wastes. Chemicals are also added which precipitate out most of the phosphorus compounds in the sewage. The sewage then passes into the inner region of the activated sludge tank. This is the settling tank. Here the bacteria settle to the bottom, from where they are pumped back to the aeration tank to be reused. Next, the clarified water from the top passes into the pebble beds to be filtered. This removes suspended solids which escape from the biological treatment phase. Before the sewage is released into the local creek or re-used by various industries in the area it passes through the UV (ultraviolet) treatment plant to be disinfected. We are converting most of our plants to use UV disinfection and only two plants still use chlorine. The bacteria in the aeration tank are always growing and reproducing. To keep their numbers in control, some bacteria are removed regularly. These bacteria and other solids which are removed are known as sludge. The sludge is piped about 8 kilometres to a main sewer from where it flows to the Eastern Treatment Plant at Carrum for further treatment. Physical processes relying on gravity or mechanical assistance to separate solids and gases from water. Chemical processes relying on chemical reactions to convert dissolved or tiny particles of suspended solids to solids that can be physically separated; or to oxidise or reduce impurities. Biological processes relying on bacteria which can convert dissolved and very fine solid impurities to more bacteria and gas. Land Treatment processes relying on components of each of the previous three groups. All of these processes remove solids from the sewage in the form of sludge. The more efficient a sewage treatment process is, the greater the amount of sludge it will produce. Most, if not all, the previously noted treatment processes only remove some of the disease-causing pathogens from the sewage. Final disinfection is needed prior to disposal to kill any remaining pathogens. Although not all the processes described here are carried out by us, they have been included as they are used in many large sewage treatment plants, for example, Melbourne Water's Eastern and Western Treatments plants (both on the outskirts of Melbourne).